When I unwrapped these from my supplier, fresh from Brazil, I was simply overcome! 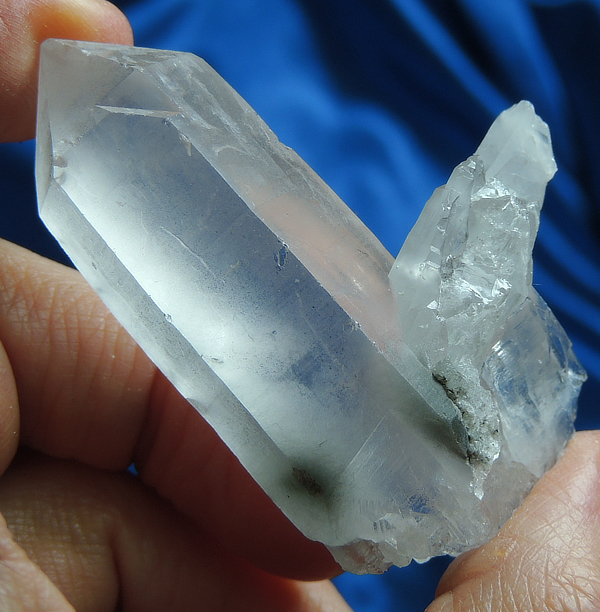 Each shipment of Blue Tara quartz has been different, yet similar in energy! The beautiful blue color within the quartz comes from riebeckite inclusions and this wonderful crystal is gently frosted with her riebeckite in the base … along with her students. Several of the students were broken but have totally healed and one student has a fresh ding. The frosted effect makes her look truly as icy as a January morning! Her termination is a near perfect Merlin (aka generator) although there is a very thin, small scrape along one facial edge. Except for the above-mentioned healed dings, she is in most excellent condition and looks forward to meeting her forever Keeper! She weighs 1.4 oz and is 2.25” by 1.8” by 0.8”. In Tibetan tradition, there is a Green Tara and a White Tara with Green Tara protecting Earth and White Tara protecting long life and peace. Tara, whose name means “star”, is further the equivalent of a female Buddha. Now, this crystal is blue not green, and she feels like a different aspect of Earth – the oceans. Earth is more ocean than land, so it’s particularly suiting that Blue Tara also represents the Earth. And further, her ice blue color brings in the energies of the Arctic regions. Beyond her other energies, she offers to her Keeper a wonderful way to work with the energies of the Earth and contribute to the repair of the damage humans have done. Cradle this Spirit in a hand and immediately, you will feel yourself surrounded by a halo of energy and there will be a fragrance, somewhat like lily-of-the-valley; sweet, clear and heady. In her is love and compassion, understanding and knowing. She clears away pretense and pain, opening your heart and your mind to her protection and guidance. It is said that Green Tara offered protection to those incarcerated during the Chinese occupation of Tibet. Blue Tara offers protection to the Oceans and Oceanic Ice and those born of the Water Signs. The Celts also have a Tara, the Fins have Tar, the Egyptians, Ishtar and the Cheyenne have Star Woman - all Tara. She is all cultures, all races and all women. Work with her in celebration of peace, protection and all that is life and life-giving – she is astounding!